Simulating traffic is a science in itself with each car acting as an agent that is aware of its surroundings. 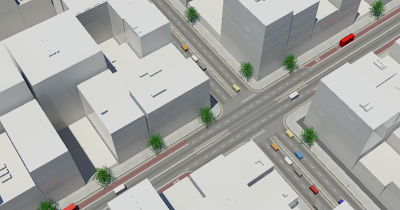 It is notoriously difficult to create convincing traffic flow in 3D packages without input from specialist simulations and as such its a good challenge for our recent explorations of using agents in 3D Max to populate city models. New Scientist highlighted the ‘Shockwave’ theory of traffic simulation this month with an article on how a team of Japanese researchers has recreated the phenomenon on a test-track for the first time. If you then set up ‘three teams’ linked to a network with behaviour based on varying speed and avoidance calculations you can create a basic traffic flow simulation. Read more about the Shockwave Theory and NetLogo. 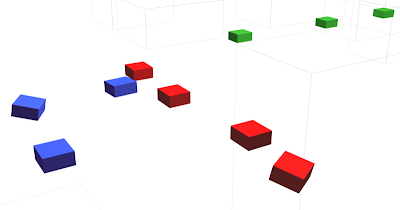 Wondering if you’ve looked at packages like VISSIM that are specifically design ed to do this sort of traffic modeling, or are you trying to work completely within visualization packages?